Background: A new type of treatment is still needed for sporadic Alzheimer disease. The ion chelating agent (such as M30 and HLA-20) and other kinds of ion chelating agent possess brain tissue permeability. At present, the study has confirmed that ion chelating agent possesses a certain neuroprotective effect on neural degenerative disease. The objective of this study is to explore the related mechanism of ion chelating agent by applying the rat model of Alzheimer disease. Methods: Injected STZ into the encephalocoele to make rat AD model and took M30, HLA20 ion chelating agent orally. Then we evaluated the function of ion chelating agent by water maze test, passive avoidance test and other behavioral tests. Results: Compared with the rats in simple AD group, the spatial memory impairment of the rats in chelating agent group was reduced. Taking chelating agent orally for 11 w could make the rats with formed memory damage return to normal level in passive avoidance test. Long-term treatment could recover STZ induced high phosphorus acidification and the expression level of insulin degrading enzyme in hippocampal area. Conclusion: Ion chelating agent possesses obvious therapeutic effect of nerve protection in STZ induced AD rat model. Ion chelating agent, Alzheimer disease, M30, HLA-120. Alzheimer Disease (AD) is a kind of neural degeneration diseases, which main clinical manifestation is progressive memory loss. At present, the new and effective treatment methods are needed urgently. The existing clinical and animal research methods are mainly simulating familial or sporadic AD. And the transgenic animal models are mainly familial AD, while it does not have representative significance on Alzheimer disease [1-3]. In animal models, made encephalocoele in a state of insulin resistance and slow down the glucose metabolism in brain tissue by intervention, which could produce the performance similar to sporadic AD. This was the same with the result of clinical autopsy analysis. At the same time, the animal models also expressed cognitive disorders, the decreased cholinergic nerve transfer in brain tissue and other features of chronic nerve degeneration which included oxidative stress, neurogenic inflammation, Tau protein phosphorylation, pathological Aβ accumulation and brain amyloidosis . Because ion accumulation played an important role in pathologic process of AD, metal chelating agent has gradually become one of the main methods of AD treatment. Deferoxamine was regarded as a natural chelating agent and free radical scavenger, which could slow down the clinical progress of AD dementia and control the formation of amyloid protein. Clioquinol, PBT2 and 8-hydroxy double tooth ligand chain could reduce the damage on cognitive function and control Aβ accumulation of transgenic rats [5-9]. M30 and HLA20 were regarded as multiple target ion chelating agents that could remove free radicals and restrain the related lipid peroxidation at the same time. The neuroprotective activity of M30 has been confirmed in some animal models of neural degeneration disorders [10,11]. So in conclusion, the objective of this study was using Alzheimer disease model to explore the related effect of ion chelating agent on it, which could provide references and guidance for clinical treatment and basic research. In this study, the Streptozotocin (STZ) that was used in the established animal models was bought from Biomedical Engineering (Shanghai) limited company. 40 Wistar rats were bought from Beijing Weitong Lihua Biotechnology Co. Ltd., the average weight was 250-330 g. Divided the rats into 4 groups: group A (control group), group B (simple STZ group), group C (STZ+M30 group) and group D (STZ+HLA20 group). All the rats were raised under a standard condition, the light/ dark time was 12 h. The temperature and humidity of the room was 25°C and 40-60% respectively, free eating and watering. We injected 60 mg/kg sodium sulfide and 5 mg/kg valium into peritoneum for deep anesthesia and executed after cognitive function evaluation for all the animals. All the operations were informed and agreed by the ethics committee of our hospital. Rats were anesthetized by using chloral hydrate according to 350 mg/kg weight and dosage. Injected STZ to cella lateralis according to single dose, injected equal amounts of citric acid salt solution into the control group (pH was 4.5). Necessary nursing care was given for all rats during anesthesia period. Groups C and D received ion chelating agent treatment after injecting STZ. The time of give ion chelating agent was 9:00-10:00 a.m. every day, the route of medication was oral catheter. Gave M30 (10 mg/kg/day) to the rats in group C, while gave HLA20 (5 mg/kg/day) to group D. The main dosage of the drug was based on the relevant reports in the literature . Equal amount was given of physiological saline to the rest two groups. We processed detection of cognitive function 3 months after STZ induction. The contents included Morris Water Maze (MWM) and spatial memory ability (Figure 1a). Fear induced avoidance memory in passive avoidance test (PA) (Figure 1b). According to the reported methods in literature, evaluated animals’ spatial memory ability by the time of finding the platform and the times of entering the wrong region in MWM test . PA test space contained a light room and dark room, there was an automatic gate between them, the gate could be automatically closed when the rats entered the dark room from the light room. There was no treatment on the first day of the test, just made the rats adapt the environment. In the second day, gave 0.5 mA after the rats entered the dark room and plantar electric stimulation for 2 s. In the subsequent experiment, we mainly recorded the delay time of entering the dark room from the light room after being stimulated. Figure 1. 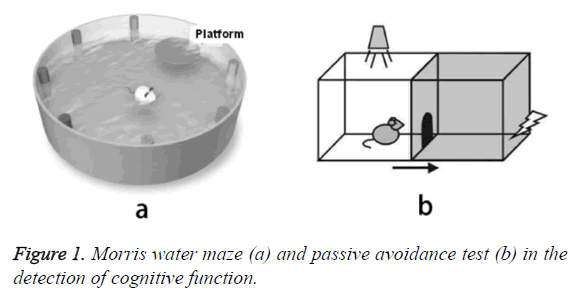 Morris water maze (a) and passive avoidance test (b) in the detection of cognitive function. Hippocampal tissue was obtained from one side of brain tissue of each rat, and then processed the tissue homogenization treatment by using 3 times the volume of the lysis buffer. The content of lysis solution included 10 mM HEPES, 1 mM EDTA, 100 mM KCl, 1% Triton X-100 (pH 7.5) and protease inhibitor cocktail (1:100). Obtained the liquid supernatant from homogenate by centrifuging for 10 min under the condition of 4°C 12000 rpm, then froze and stored them under the temperature of -80°C. Tested the protein concentration by Lowry protein detection. Made SDS-PAGE separation by 9% polyacrylamide gel and transferred the sample protein (35 μg) to nitrocellulose filter, then put and incubated the membranes in 5% fat-free milk and low salt washing buffer (LSWB) for 1 h at the room temperature. Incubated with anti AT8 (recognize tau protein phosphorylated at both serine 202 (Ser202) and threonine 205 (Thr205)) (1:500) and total anti tau antibody (1:500) overnight at the temperature of 4°C or incubated with primary antibody anti PHF1 (1:500) at the room temperature. In the next day, used LSWB solution to wash the membranes for 3 times, then re-incubated them with secondary antibody (anti-mouse or anti-rabbit IgG, 1:5000) for 1 h at the room temperature. Used chemiluminescence Western blotting assay kit to immunol staining after washing by LSWB for 3 times. After using DNR biological imaging system for signal capture, re-incubated with anti-GAPDH antibody (1:2000) or anti- βactin antibody (1:5000) according to the same operation. We used SPSS 20.0 software to process statistics and analysis of all data, the data was recorded as the average value ± standard deviation. The analysis method was that we used parametric variance analysis after applying nonparametric variance analysis or Tukey HSD test after Mann-Whitney U test. If p<0.05, then the differences had statistical significance. In Morris water maze test, compared with control group, the rats showed obvious memory dysfunction after being treated and induced by STZ for one month. The specific performances were the rats’ location ability of interval position with platform was poor, and the increased number of entering into the wrong place. The differences had statistical significance. The swimming time in the target compartment was shortened after removing the platform (p<0.05). While the extent of spatial memory impairment in rats that was pre-treated with M30 and HLA-20 was significantly decreased. The main performances were the reduced errors and extended retention time in target compartment . The differences between the two kinds of chelating agent and control group was not obvious (Figure 1). In Figure 2, after using M30 (10 mg/kg) for 11 w, the fear avoidance memory impairment induced by injecting STZ into cella lateralis had significant recovery. We also observed that compared with simple STZ treatment group, the obvious Fear avoidance memory ability of HLA20 (5 mg/kg) for one month after 1 month. There was no obvious difference between these two kinds of ion chelating agent, which was almost close to the normal group after 3 months (Figure 3). Figure 2. 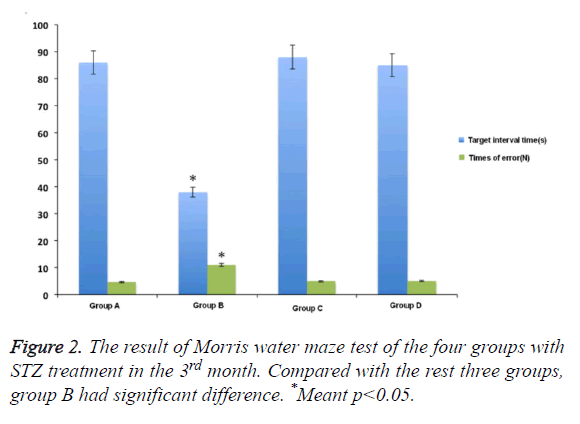 The result of Morris water maze test of the four groups with STZ treatment in the 3rd month. Compared with the rest three groups, group B had significant difference. *Meant p<0.05. Figure 3. The results of PA test of each group 11 w after treated by STZ. There was no significant difference in the delay time of entering into dark room between ion chelating agent group and control group, which was obviously higher than that of simple STZ induced group. *Meant p<0.05. IDE was the main molecules that involved in the pathophysiology of AD. The IDE expression of rat hippocampus area 3 months after STZ treatment was lower than that of group A (p<0.05). Compared with group B, the IDE expression level of groups C and D increased significantly, but it was still lower than that of control group. At the same time, the study also showed that after being treated with M30 and HLA20, it could obviously decrease the expression of AT8 phosphate tau protein after injecting STZ into cella lateralis (p<0.05) (Figure 4). Figure 4. 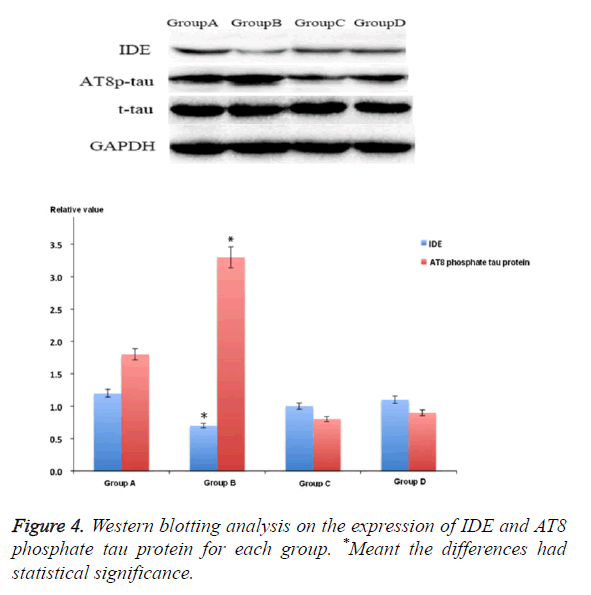 Western blotting analysis on the expression of IDE and AT8 phosphate tau protein for each group. *Meant the differences had statistical significance. At present, a number of clinical trials on AD have not yet demonstrated the efficacy of a variety of drugs. The reasons may be due to the understanding of the mechanism of drug action and the pathophysiology of the disease was not enough. For example, at present, it is widely accepted that mainly effect Aβ steady state, tau protein phosphorylation and assembly. While this is often only for a single pathological process . More and more evidences show that for sporadic AD, there may be different intrinsic phenotype of apolipoprotein E positive and negative individuals, which indicates that it might be more targeted to explore a part of populations by establishing specific phenotype of animal models selectively. Considering the polytrope of AD pathogeny, new treatment measures should be aimed at the targeted therapy of neurons in a number of pathological aspects [15-17]. The steady state of ion in brain tissues is closely related to normal brain function, especially the learning and memory ability. At present, the studies have shown that the disorder of its metabolism and pathological accumulation in brain tissue related to AD lesion. So ion chelating agent medicines might possess the potential therapeutic value . M30 and HLA20 are the multifunctional compounds which have already been explored. They contain propynylamine, rasagiline nerve activity protection components, antioxidants and etc. Iron complexing agent had been suggested to be used in treating AD previously, but this kind of chemical compounds could not be widely used in clinical treatment, because they had toxicity or could not get through blood brain barrier. While M30 and HLA20 were multi-target, non-toxicity and they could get through blood brain barrier, exert the chelating effect, clean free radical, control lipid peroxidation and etc., which had been confirmed to have neuroprotective activity in the animal model of degenerative nerve. The study has confirmed that the neuroprotective activity of M30 was achieved by inhibiting the further deterioration of cognitive function in rats after STZ treatment. Removed other experimental factors, the curative effect of M30 possessed dose dependent, which could be improved and increased with the prolongation of treatment time [19,20]. At the same time, the differences in the injection sensitivity of streptozotocin could also influence curative effect of M30. After STZ treatment, working memory impairment of rats was more seriously than spatial reference memory. The curative effect of M30 was limited, which might relate to its strong sensibility. At present, the exact mechanism of the cognitive impairment induced by injecting of streptozotocin into the lateral ventricles is not clear, but its direct nerve toxicity, brain glucose/energy, and the lack of cholinergic factors, oxidative stress, insulin resistance and other factors might become the basis of learning and memory impairment. STZ could produce free radical, NO, hydrogen peroxide in cells and bring toxic action on islet cell selectively. The latest study showed that M30, HLA20 and other ion chelating agents possessed multiple nerve protection regulation, which mainly included the up-regulated level of insulin/insulin receptor/glycogen synthase kinase β level, activation of hypoxia inducible factor-1 pathway, antopxidation effect and etc. . In this study, we also preliminarily confirmed that used M30 for a long time could recover IDE expression level in rat hippocampus area gradually. At present, IDE has been confirmed to be a metalloprotease which was mainly responsible for the degradation of insulin and Aβ. Its reduced expression and degradation played an important role in pathological progress of AD. In conclusion, our study has preliminarily confirmed that ion chelating agent possesses obvious therapeutic effect of nerve protection in STZ induced AD rat model. Balducci C, Forloni G. APP transgenic mice: their use and limitations. Neuromolecular Med 2011; 13: 117-137. Borroni B, Grassi M, Costanzi C, Archetti S, Caimi L, Padovani A. APOE genotype and cholesterol levels in lewy body dementia and Alzheimer disease: investigating genotype-phenotype effect on disease risk. Am J Geriatr Psychiatry 2006; 14: 1022-1031. Salkovic-Petrisic M, Osmanovic-Barilar J, Knezovic A, Hoyer S, Mosetter K. Long-term oral galactose treatment prevents cognitive deficits in male Wistar rats treated intracerebroventricularly with streptozotocin. Neuropharmacology 2014; 77: 68-80. Agrawal R, Tyagi E, Shukla R, Nath C. Insulin receptor signaling in rat hippocampus: a study in STZ (ICV) induced memory deficit model. Eur Neuropsychopharmacol 2011; 21: 261-273. Shachar DB, Kahana N, Kampel V, Warshawsky A, Youdim MB. Neuroprotection by a novel brain permeable iron chelator, VK-28, against 6-hydroxydopamine lession in rats. Neuropharmacology 2004; 46: 254-263. Crichton RR, Dexter DT, Ward RJ. Brain iron metabolism and its perturbation in neurological diseases. J Neural Transm (Vienna) 2011; 118: 301-314. Grunblatt E, Salkovic-Petrisic M, Osmanovic J, Riederer P, Hoyer S. Brain insulin system dysfunction in streptozotocin intracerebroventricularly treated rats generates hyperphosphorylated tau protein. J Neurochem 2007; 101: 757-770.
de la Monte SM, Wands JR. Review of insulin and insulin-like growth factor expression, signaling, and malfunction in the central nervous system: relevance to Alzheimers disease. Alzheimers Dis 2005; 7: 45-61. Guo C, Wang P, Zhong ML, Wang T, Huang XS, Li JY, Wang ZY. Deferoxamine inhibits iron induced hippocampal tau phosphorylation in the Alzheimer transgenic mouse brain. Neurochem Int 2013; 62: 165-172. Honda K, Casadesus G, Petersen RB, Perry G, Smith MA. Oxidative stress and redox-active iron in Alzheimers disease. Ann N Y Acad Sci 2004; 1012: 179-182. Kilkenny C, Browne W, Cuthill IC, Emerson M, Altman DG, NC3Rs Reporting Guidelines Working Group. Animal research: reporting in vivo experiments: the ARRIVE guidelines. Br J Pharmacol 2010; 160: 1577-1579. Kupershmidt L, Amit T, Bar-Am O, Youdim MB, Weinreb O. The novel multi-target iron chelating-radical scavenging compound M30 possesses beneficial effects on major hallmarks of Alzheimers disease. Antioxid Redox Signal 2012; 17: 860-877. Lannert H, Hoyer S. Intracerebroventricular administration of streptozotocin causes long-term diminutions in learning and memory abilities and in cerebral energy metabolism in adult rats. Behav Neurosci 1998; 112: 1199-1208. Lee Y, Kim YH, Park SJ, Huh JW, Kim SH, Kim SU, Kim JS, Jeong KJ, Lee KM, Hong Y, Lee SR, Chang KT. Insulin/IGF signaling-related gene expression in the brain of a sporadic Alzheimers disease monkey model induced by intracerebroventricular injection of streptozotocin. J Alzheimers Dis 2014; 38: 251-267. Lester-Coll N, Rivera EJ, Soscia SJ, Doiron K, Wands JR, de la Monte SM. Intracerebral streptozotocin model of type 3 diabetes: relevance to sporadic Alzheimers disease. J Alzheimers Dis 2006; 9: 13-33. Liu P, Zou LB, Wang LH, Jiao Q, Chi TY, Ji XF, Jin G. Xanthoceraside attenuates tau hyperphosphorylation and cognitive deficits in intracerebroventricular-streptozotocin injected rats. Psychopharmacology (Berl) 2014; 231: 345-356. Mcmahon S, Grondin F, Mcdonald PP, Richard DE, Dubois CM. Hypoxia-enhanced expression of the proprotein convertase furin is mediated by hypoxia-inducible factor-1: impact on the bioactivation of proproteins. J Biol Chem 2005; 280: 6561-6569. Mechlovich D, Amit T, Mandel SA, Bar-Am O, Bloch K, Vardi P, Youdim MB. The novel multifunctional, iron-chelating drugs M30 and HLA20 protect pancreatic beta-cell lines from oxidative stress damage. J Pharmacol Exp Ther 2010; 333: 874-882. Mechlovich D, Amit T, Bar-Am O, Mandel S, Youdim MB, Weinreb O. The novel multi-target iron chelator, M30 modulates HIF-1alpha-related glycolytic genes and insulin signaling pathway in the frontal cortex of APP/PS1 Alzheimers disease mice. Curr Alzheimer Res 2014; 11: 119-127. Mechlovich D, Amit T, Bar-Am O, Weinreb O, Youdim MB. Molecular targets of the multifunctional iron-chelating drug, M30, in the brains of mouse models of type 2 diabetes mellitus. Br J Pharmacol 2014; 171: 5636-5649. Morris AM, Churchwell JC, Kesner RP, Gilbert PE. Selective lesions of the dentate gyrus produce disruptions in place learning for adjacent spatial locations. Neurobiol Learn Mem 2012; 97: 326-331.